In the first two weeks, you are still not pregnant. Your baby will be a mustard seed. In the third week, the fetus is formed. But the size of the blast is the same. In the first two weeks, your body is preparing for ovulation. The uterine is preparing for the arrival of pregnant egg. From the third week, there will be a lot of improvements! Your pregnant egg goes to the uterus through the biliary tube. At the time of the fetus, the ovary turns into more than 100 cells. Now you have to call this nucleus. Your embryo should penetrate into the abdomen. This procedure is called "cure". For the first two weeks, you are not officially pregnant. In these weeks, the wall of your ward will break with the unbroken egg in the last month.Your body is preparing for the sake of consciousness.After the end of the month, the color and viscosity of the ovary will change. It's harder and more productive from being bleached. This is the right time for compatibility. 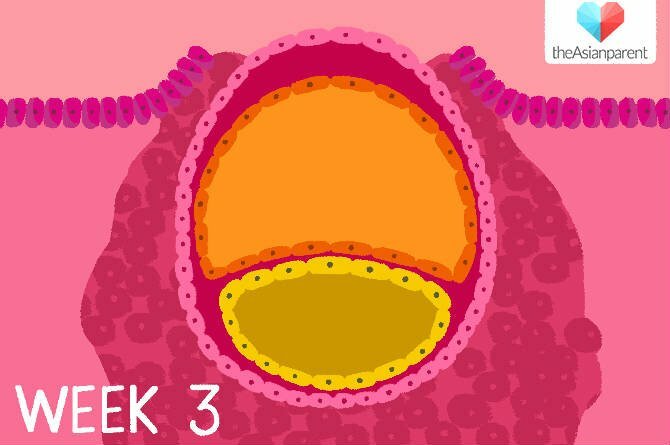 At the end of the third week , the fetus will penetrate into the envelope of the uterus. This will result in a drop drops. The name "Bleeding Bleeding"
Your breasts will appear smoother and tender. You can feel a lot of breast as much as you can feel after a month. Your nourishment will increase - your favorite fragrance may even be of interest to you at this time. The body temperature is high. If you use a pregnancy test device at this time, it will be positives. Pre-natal vitamins should be eaten. Get rid of alcohol and smokers. Drink at least six to eight glasses of water daily. Take daily 400 micrograms of folic acid everyday to ensure healthy growth of the child's brain and spine. Coffee consumption should be reduced. Guinea can have a negative impact on fertility. The pox and rubella vaccines should be put in advance. Your doctor may recommend these vaccines before you become pregnant. You will learn about the life style, genetic and environmental risks. At this meeting, talk to the doctor about exercise, food and vitamins intake. Talk to the doctor about medication without herbal medicine or prescription. When you start to conceive, ask the doctor to check whether these medications are right.